Side Note: I lived and taught Electronics in Greece (to Greeks) for many years primarily in Kavala, Thasos, and Rhodes. I became very familiar with Greek history and culture. While I was not able to visit the Island of Patmos (which is a part of Greece’s Dodecanese island group), the Island of Rhodes (Rodos as the Greeks call it) is. I learned much from the Greeks on that beautiful Island. Thank you, Mr. Mohammed, (a Turk and resident on Rhodos) for being a great history teacher. So the Apostle proceeds to write down everything he will be shown by the angel. It is important to know that was commanded to write down in a scroll – this revelation scroll – what he sees and was directed to send the completed revelation to the seven churches (more accurately, congregations of Christs followers) in Ephesus, Smyrna, Pergamum, Thyatira, Sardis, Philadelphia, and Laodicea. 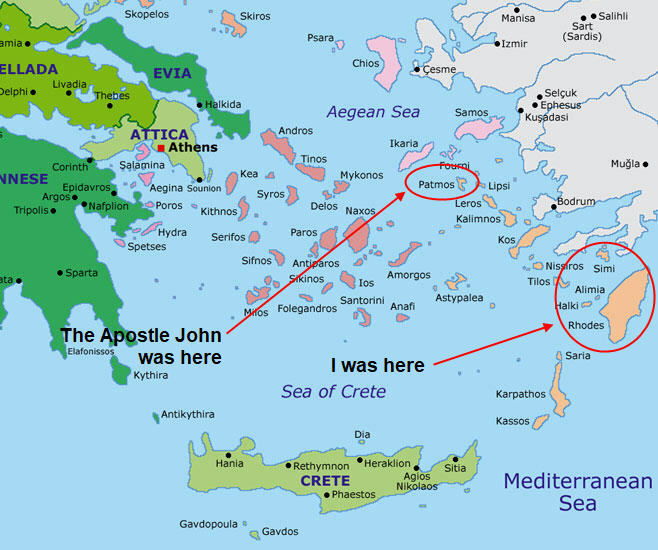 The Apostle John is on a small remote Greek penal Island of Patmos. in the Aegean Sea. Apparently, John was able to get mail dispatched off of the Island. The angel told down to write down everything he will be showed and put it in a scroll and send it to the seven congregations of fellow worshipers in The Province In Asia. Some may confuse this with the continent of Asia. 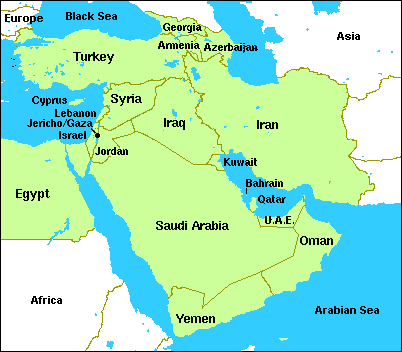 The Asia referred to here is the Roman province of Asia also known as Phrygia. It was a Roman Senatorial province governed by a proconsul. Today, Phrygia what is known as Asian Turkey. This region called The Province of Asia had as its capital the ancient Grecian city of Ephesus which today is in Turkey (a part of the region of Asia Minor). Note: The Province of Asia is called Asia Minor. Why? Well, when the Greeks started to learn that there more lands referred to as Asia, they started calling it Asia Minor. The Apostle John referred to it as The Province of Asia. The distance from Patmos to The Province of Asia – and in Particular its capital in Ephesus – is about 479 miles (771 KM). Since Patmos was the most Northern Island (and coldest) of the Dodecanese island group, one had to traverse by sea and then by land to reach the Province. It is also apparent that The Apostle John had loyal followers of Christ he trusted to deliver the revelation scroll as directed by the angel. In either case, nothing would have stopped its delivery as an angel had directed its delivery. Do we not have this scroll today? It is one of the most precious things you can have in your possessions today. No, not “The Bible” but this scroll many today know as The Book of Revelation. This will become glaringly clear to you at the completion of the entire discussion of this scroll. Jesus Christ is not being referred to here. The Apostle John starts at the top, the Father himself. He is letting all of the seven congregations know that this revelation – the things that he saw and witnessed and told to write down – was from the Father. That He is shows that He is now at present is who He says he is. He is The Most Holy, The One and Only True God, the Creator of the heavens and the earth, and the author of the revelation. There is no equal. There is no one or nothing above Him. He alone is God. That He is who was shows that in past times everything He said he would do He did. That everything He spoke came to be. That every promise He made, He kept. That every utterance He made was the truth. Even in the beginning when He ordered “Let there be light,” light came to be. He is God and the “I am.” He has proven that He is what He says He is, God Almighty by His powerful acts that no one can imitate without His permission. That He is to come shows that what He will accomplish in the future will also come to fruition as they did in the past and present. That everything in this scroll (revelation) will come to be as He has spoken and given to His Son, Christ Jesus. This reveals that God has seven spirits. These seven spirits stand ready to act and carry every command given them by The Almighty. These seven spirits represent The Almighty’s infinite power. While I hate to make an analogy to the movie Star Wars, the seven spirits are like “The Force.” They are God’s active force. When God said, “Let there be light,” it was this (His) seven spirits (collectively His Holy Spirit) that made it so. The Apostle John uses the conjunction “and” to show that another one – who is not God – is in agreement with the Almighty and His seven spirits with the granting of grace and peace upon the seven congregations of worshipers in The Province of Asia. Who is that one? Jesus Christ! As God’s spokesman and recipient of the revelation from His Father, why would he not be in agreement and on the same page as His Father? That Jesus is the only one born of a human woman and having lived on earth as a man and the only human to ascend into The Most Holy’s presence, he is thoroughly qualified as “The Faithful Witness” before mankind and one who can vouch for and attest to His Father’s reputation that He is alone is God, the Creator of the heavens and the earth! Since the creation of the first man – the first Adam – from the dust of the ground, there has not been one man who has died and was resurrected directly by God to be granted everlasting life! Not one! That is why we must obey God’s command at Luke 9:35 to “Listen” to His Son. Are you listening to him or to religious organization or others? The Apostle John is told by the angel that Jesus is the ruler of the kings of the earth. This requires a little explanation. It is important that you understand who these kings of the earth are. Many within the world of religion teach that these kings of the earth are the leaders or heads of state of the existing governments or nations of the world. This is is a grave mistake. Why? Because when Jesus is coronated king over the earth, none of these governments will be in existence. They will have all been destroyed by God Almighty in order to clean the slate and make way for His appointed king over the earth. So who are these kings of the earth that Jesus Christ will be ruler over? The expression “kings of the earth” is mentioned 11 times in The Book of Revelation. At Revelation 1:5, Revelation 5:10, Revelation 6:15, Revelation 16:14, Revelation 17:2, Revelation 17:18, Revelation 18:3, Revelation 18:9, Revelation 19:19, and Revelation 21:24. Notice at Revelation 5:9-10 from where these kings come from. They are not from the existing nations of the world. When Jesus gave up his life in behalf of all of mankind (whether they accepted or acknowledged him or not), he purchased for His Father persons from every tribe and language and people and nation. Jesus made THEM to be a kingdom and priest to serve God. Under angelic direction, the Apostle John goes on to say that THEY WILL reign on earth! There is nothing meek or Christ-like about the leaders and heads of state of the governments today. No, those who will be selected and given kingly authority within Christs future 1000-year kingdom will be from a source of men unlike that we see today ruling the nations of the world. They will be the humblest and meekest among mankind. Jesus will know who they are. Will you and I be among those selected for that honor? How many will be selected as kings over the earth under Christ? Again, under angelic direction, John sees and writes. At Revelation 14:1. Notice who is with Jesus Christ, the Lamb of God. These persons will be the first to be resurrected from among all of mankind ever to have lived and walked on the earth the dead by Christ (to include Adam) and THEY will rule (reign) WITH Christ (as is representatives on earth) for 1000 years! Stop at this point if this is not sinking in! Think about this! These are the kings of the earth. They have not been selected yet. Most of them are still in their graves awaiting a promised future resurrection from the dead by Christ, some are among us at present and probably do not know that they will be one of those kings, and many are yet to be born. But their number is sealed (or limited) to 144000 meek. What the Apostle John says next carries the utmost attention to every person ever born, lived, and died since the creation of the first man. I cannot over-emphasize this. What the Apostle says here shoots large holes in the false teachings issuing out of religious organization that one must accept Jesus as their Lord and Savior in order to qualify for salvation. This is a lie. The Apostle reminds the congregations in The Province of Asia that it was the ascended Jesus Christ who loved them and that by the sacrifice of his life he freed them from their sins. Notice the past tense, freed. Even the familiar utterance at John 3:16 shows that God loved the world (of mankind, His creation) so much that He gave His only Son that who whoever believes in him shall not perish, but have everlasting life. John 3:16 does not say that God loved the world of Christians so much, it says the whole world of mankind. The belief mention in this scripture is a recognition that if anyone listens to what Jesus says (as He is The Word of God) and believes what he says, those words, those teachings would lead one down the path that will lead to everlasting life. Jesus never demanded rituals or joining religious organizations or taking upon oneself fancy religious titles such as Christian, Catholic, Lutheran, Jehovah’s Witnesses, Mormons, etc. Those things are from men. Jesus simply asked that one become his disciple (student) and follower (believe the things he would teach as they were the truth) and those things would place one on that road that leads to everlasting life. (Matthew 7:13-14, Matthew 28:19-20).